After getting my peas in the ground, I decided to go ahead and plant some onions. 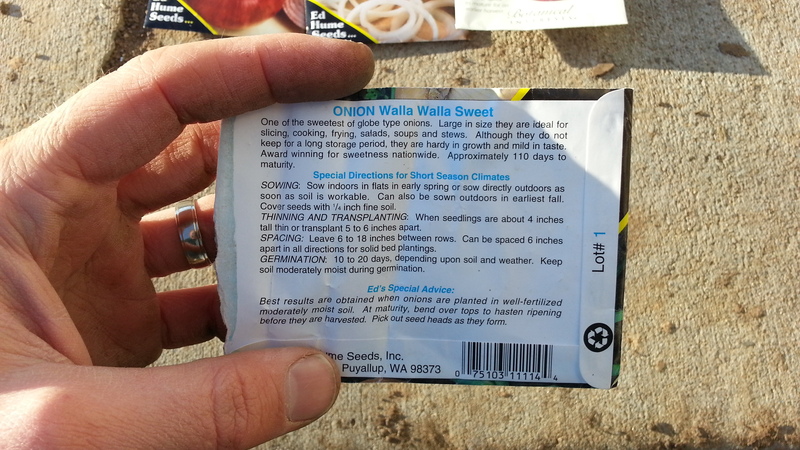 Onions can be planted “as soon as soil is workable” according to Ed Hume Seeds. This makes them one of the first things to go in the garden. 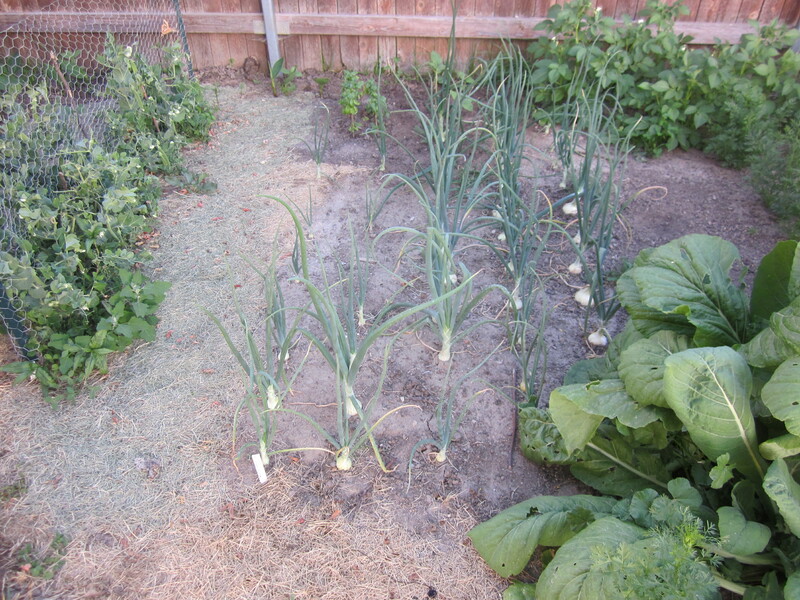 Onions can be planted directly in the garden or can be transplanted from a grow light. Many people use onion sets to grow onions, but I have had success by just using seeds. One nice thing about onions, is that you can be pretty cost-effective by planting your own onions versus buying them from the store. 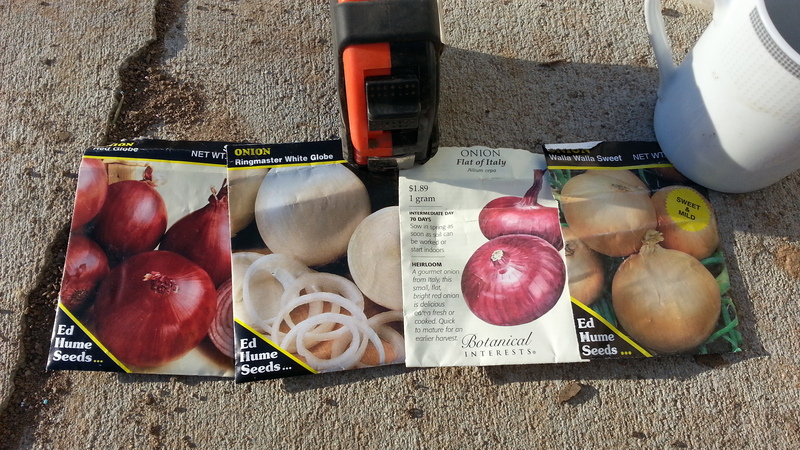 One $2 packet of seeds can result in over 100 nice onions. I like to use seeds instead of sets since they are a bit cheaper. Sets are easier to plant and more dependable, although I haven’t had much trouble with seeds so far. Buying seeds can also allow you to get more variety. Onions come in many flavors and sizes, so seeds are a cheap way to experiment. I had very good success with Walla Walla last year. I’m replanting those as well as some other varieties this year. Onion seeds were the first thing I planted in my grow light in early February, along with some lettuce and basil. You can plant seeds in the garden in February, but it was still cold and my garden wasn’t ready, so I didn’t plant in the garden until early March. If you’re using a grow light, plant onions in a tray with 1″ to 3″ of dirt. I just make little rows with my finger and then drop a seed every half inch or so. The seeds only need to be 1/4″ deep. Seeds will sprout in 10 to 20 days. Onions won’t begin to produce bulbs until there is about 14 hours of sunlight, or 12 hours of sunlight for short-day varieties. The little seedlings will have a few delicate roots. Once they are about 6 weeks old, or about 5-7″ high, take the tray to your garden. Carefully take each onion seedling out of the tray and transfer it to your garden soil. You might need to separate the seedling roots from each other depending on how close you planted them. You can also cut an inch or two off the top of the onion seedling when you transfer it since the seedlings are a bit top heavy. 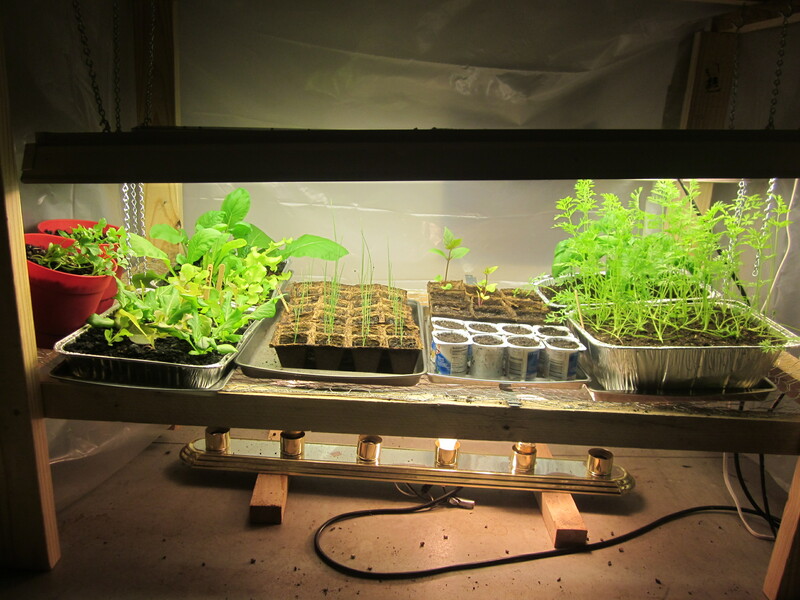 You can see my onions left of center under the grow light in the picture below. I tried experimenting with a peat tray last year, but this year I’m using metal and plastic flats which are easier to work with and easier to extract the onion seedlings out of. You can plant onions in “patches” rather than rows if you want to preserve space. Big onions typically need 5″ to 6″ of space, while smaller onions require less. To make a patch, just make a grid with the onions separated by ~6″ in each direction. Basically this is the same as making rows that are 6″ apart. You can pack quite a few onions in a small space. For example, in a 5′ by 5′ area, you could place 121 onions (11 x 11) if you separate them by 6″, and 169 (13 x 13) if you reduce that to 5″. If you don’t want to use a grow light, or if you’re like me and you want to get onions at different times and diversify your planting method, then you can also plant seeds directly in your garden. To do this, I make a small indentation in the dirt to form a row. I put down the measuring tape and drop a seed about every 4″. This way if some don’t grow I won’t be wasting much space. Then I cover up the row. If they’re too close, I can either pick them a little early or thin them out. 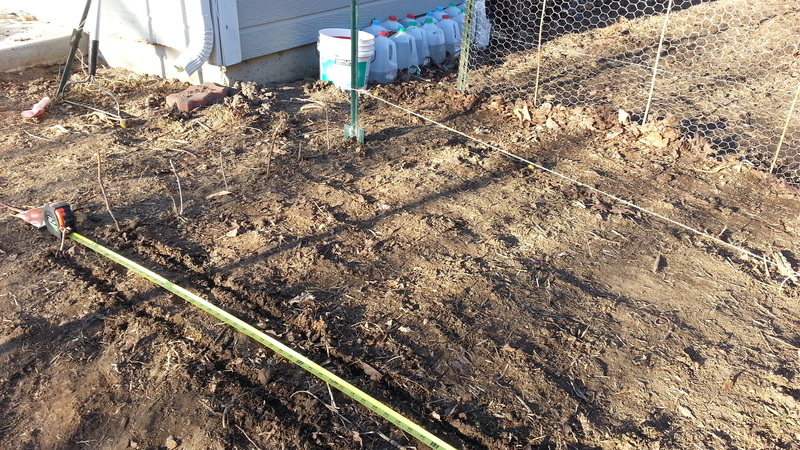 This year I marked my rows, which are 6″ apart, using sticks on either side. Soon I’ll add my grow light seedlings where my rows stop. I’ll have a decent size patch when everything’s planted. Last year I only planted a few onions, but they worked very well and lasted a couple of months for our family. As the onion bulbs expand, gently pull away the dirt from them so that the bulbs just sit on top of the ground. This will prevent rot. You’ll know it’s time to harvest once the tops start falling over and turning brown. You can cure the onions to preserve them by placing them in a warm, dry area with plenty of air circulation but out of the sun. You can put them on some kind of wire mesh or newspaper — something that will keep the moisture from building up. It takes around three weeks for onions to cure. Once they’re done, cut the tops to about 2″ from the bulb and store them in a cool, dry area with air circulation. Some bulbs will store better than others. If you don’t cure the onions they will likely start growing again, even if they’re just sitting in the garage.